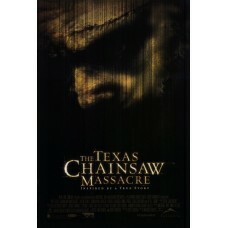 Texas Chainsaw Massacre Movie Poster 27 x 40. The Texas Chain Saw Massacre is a 1974 American slasher film, directed and produced by Tobe Hooper, who co-wrote it with Kim Henkel. It stars Marilyn Burns, Paul A. Partain, Edwin Neal, Jim Siedow and Gunnar Hansen, who respectively portray Sally Hardesty, Franklin Hardesty, the hitchhiker, the proprietor, and Leatherface, the main antagonist. The film follows a group of friends who fall victim to a family of cannibals while on their way to visit an old homestead. Although it was marketed as a true story to attract a wider audience and as a subtle commentary on the era's political climate, its plot is entirely fictional; however, the character of Leatherface and minor plot details were inspired by the crimes of real-life murderer Ed Gein. Upon its October 1974 release, The Texas Chain Saw Massacre was banned outright in several countries, and numerous theaters later stopped showing the film in response to complaints about its violence. While it initially drew a mixed reception from critics, it was enormously profitable, grossing over $30 million at the domestic box office.